DigiApe Designs: Gorgeous Quick Page for you! My Creative Team has been working hard for you! I am heading off for a last of summer trip to the lake. So while I am gone you can grab this Quick Page! 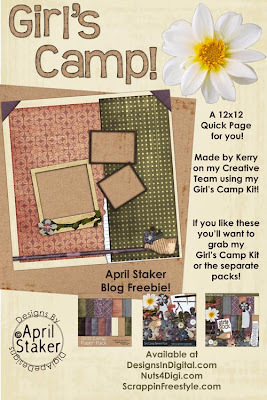 Kerry has made this gorgeous Quick Page using my Girls Camp kit. Feel free to grab a copy for yourself. Remember not to share the link, but let your friends know about my blog and they can come grab a copy for themselves! Hurry though! When I get back from the lake the link will be gone! And please support my designing by making a purchase in one of my stores! I would really appreciate it! The Link has expired. Thanks for grabbing it while it was here and supporting my designing!